Interested in WWOOFing at our place in Hawaii? Our beautiful little homestead is a perfect opportunity to learn and understand sustainable, natural gardening and farming techniques. Want to learn how to grow food anywhere in the world? This is the place. We do not use synthetic fertilizers, pesticides or chemicals to grow food. The 10 acre property is completely surrounded by water making it an island on an island and a perfect place to see nature at its best. It even has its own secluded 10 minute walk through old fruit trees to a private waterfall!! Enjoy in our daily evening walk through the old cane roads during sunset overlooking Hilo and Hamakua Coast. Located 8 miles north of Hilo on the Big Island, close to a popular surf spot, the beach and the bus stop. Hilo is a beautiful small town with lots to do and things to see. Waterfalls! Beaches! Hikes! Seclusion! Quietness! The property is full of fruit trees including bananas, star fruit, avocado, lilikoi, oranges, calamansi limes, rhombaton, coffee, coconuts and even organic sugarcane. We have fish, bunnies and three gorgeous, well behaved dogs. Our garden has abundance of things to enjoy including kale, collards, peppers, basil, variety of greens, broccoli, tomatoes, etc. We are looking for people for one week (possible two week extension) who want to learn how to grow food. Our goal is to help others learn to grow food themselves. We are wanting to trade our education, master gardening skills, use of private library, and understanding of permaculture concepts for some labor on our homestead. And no, not all pulling weeds. We need help with lots of different projects and if you want to, listen, hands-on learn, we can find something that you enjoy doing! 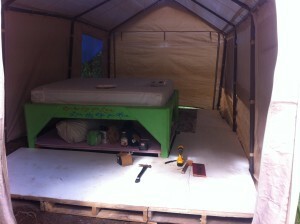 CLICK to SEE more pictures of the WWOOFer Cruz Tent! We offer a private 10 X 20 ft tent set up with a real bed! Wake up to the sound of chirping birds and the flowing stream. Hot water, outside shower, flushing toilet, electricity and county water. Expectations: depends on what you expect from us. We offer our educational work stay with or without meals. Without meals we expect you to work 3 hours for 5 days (two days off) or 4 hours for 4 days (three days off). With meals, add on an hour per day for every meal. If you want all meals included for the days you work, (6 hours, 5 days) or (7 hours, 4 days). Projects that are needing to be accomplish include building raised beds for planting, building small home scaled aquaponics systems, building worm bins, turmeric production, bunny huts and breeding program, chicken tractors, weeding the garden, hand pollinating vanilla vines, harvesting bamboo, harvesting the garden, clearing, maintaining, cleaning, hauling, planting, transplanting, web design, business help and graphic help etc. We have an all natural homestead, so there is always something to do, and something for everyone. We try not to make you do what you don’t want to do! A little about us, we have both WWOOF in the past in New Zealand and have been caretakers of property for years and understand what it is like to offer trade in labor. Jesse was born on Oahu and has a passion for growing food for the islands. He has interned at a commercial aquaponics farm for over a year and understands how to build small and large scale systems. Laura has a Bachelors of Science from the University of Hawaii, in Hilo in agriculture with a focus on sustainability. We both hold certificates in business development and business plan writing for farmers. Together we run and operate a small business selling an all organic, raw chocolate that we make. We currently sell at various markets around the island. We also provide several people with CSA vegetable drops as well as provide our turmeric for sale. Check out our educational website, www.NoSprayHawaii.com to learn more about us. We would consider single and couples, no fighting and I apologize but our homestead isn’t up to par for children at this time, hopefully in the near future! Some recent pictures of our WWOOFers and their projects! CONTACT NO SPRAY to see if there is an availability!